If comparisons between east and west can be made, kabuki is Japan’s opera. Dramatic storylines featuring sword-fights, ghosts, and love affairs are brought to life by gorgeously clothed performers speaking in hypnotically sing-song voices. Though it is said that kabuki was invented by a woman, and was traditionally performed by both sexes, men’s only kabuki dates to 1653, and actors specialise in either male or female roles. Star performers once held movie-star status throughout the country, with their faces appearing on ukiyo-e woodblock prints, and kabuki continues to maintain a strong following of devoted fans. The best-known kabuki actors are familiar both on stage and on screen. Like opera, kabuki is dramatic and spectacular enough to transcend language, though recorded English explanations and commentaries are available at the Kabuki-za theatre in Tokyo. Seeing a performance is a wonderful and unforgettable way to experience traditional Japanese culture. Regular performances are held in Tokyo, Kyoto and Osaka. 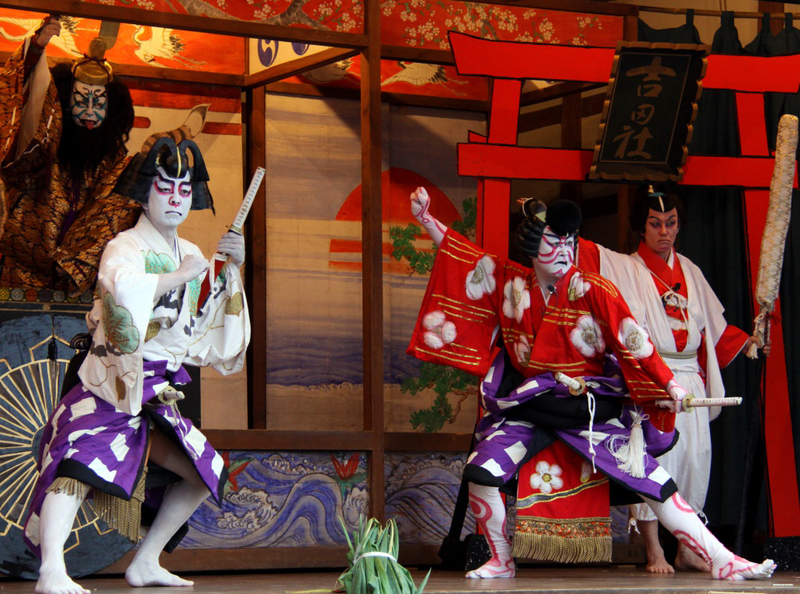 Into Japan is happy to book kabuki tickets for you during your visit to these cities.